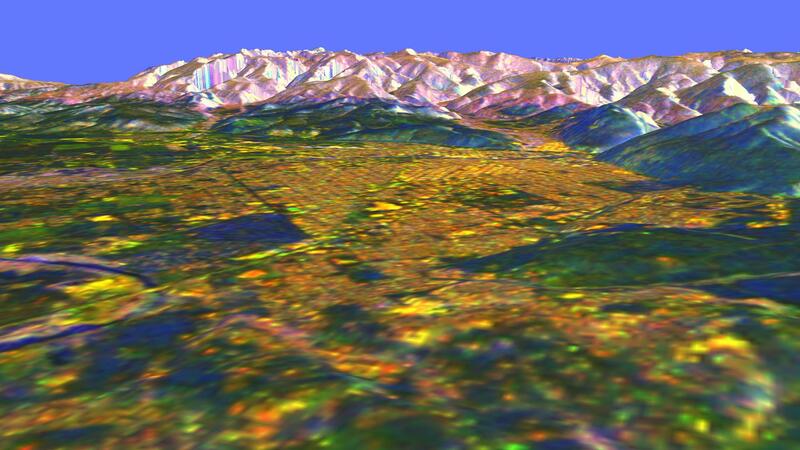 This is a three-dimensional perspective view of Missoula, Montana, created by combining two spaceborne radar images using a technique known as interferometry. Visualizations like this are useful because they show scientists the shapes of the topographic features such as mountains and valleys. This technique helps to clarify the relationships of the different types of materials on the surface detected by the radar. The view is looking north-northeast. The blue circular area at the lower left corner is a bend of the Bitterroot River just before it joins the Clark Fork, which runs through the city. Crossing the Bitterroot River is the bridge of U.S. Highway 93. 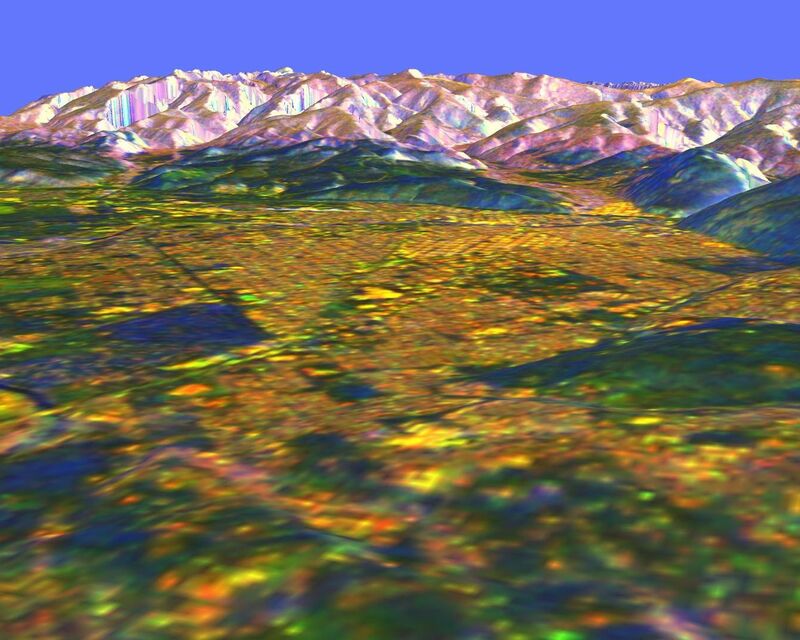 Highest mountains in this image are at elevations of 2,200 meters (7,200 feet). The city is about 975 meters (3,200 feet) above sea level. The bright yellow areas are urban and suburban zones, dark brown and blue-green areas are grasslands, bright green areas are farms, light brown and purple areas are scrub and forest, and bright white and blue areas are steep rocky slopes. The two radar images were taken on successive days by the Spaceborne Imaging Radar-C/X-band Synthetic Aperture Radar (SIR-C/X-SAR) onboard the space shuttle Endeavour in October 1994. The digital elevation map was produced using radar interferometry, a process in which radar data are acquired on different passes of the space shuttle. The two data passes are compared to obtain elevation information. 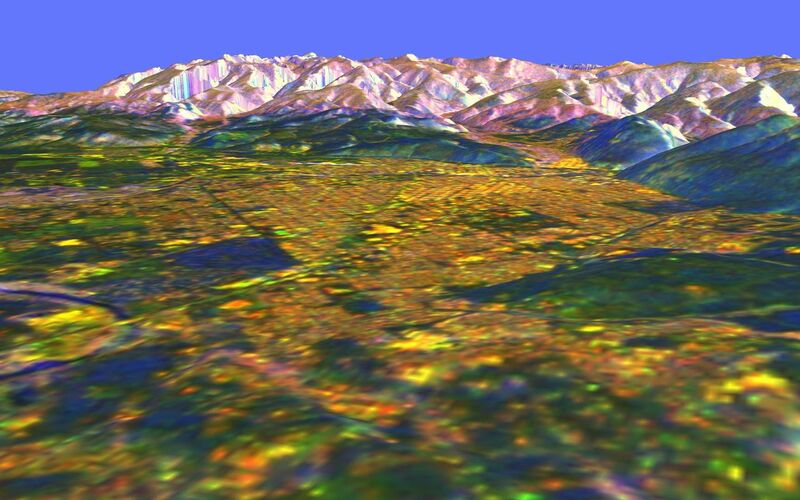 Radar image data are draped over the topography to provide the color with the following assignments: red is L-band vertically transmitted, vertically received; green is C-band vertically transmitted, vertically received; and blue are differences seen in the L-band data between the two days. This image is centered near 46.9 degrees north latitude and 114.1 degrees west longitude. No vertical exaggeration factor has been applied to the data. SIR-C/X-SAR, a joint mission of the German, Italian and United States space agencies, is part of NASA's Mission to Planet Earth program.